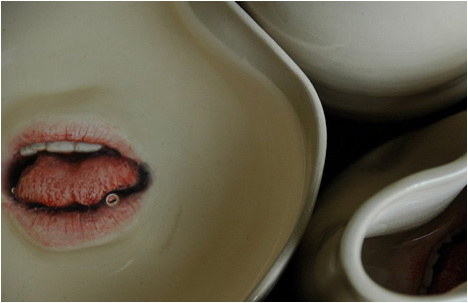 Israeli artist, uses clay and porcelain as a media. "My art expresses my life as it is at any given moment. It emphasizes my thoughts and feelings at the time. Some sculptures deal with feelings of lost or unused abilities - of which only the remains can be framed for display . Other sculptures represent the intimacy of a relationship in a minimal way - a single mouth . Also, I have created a humorous sculpture of a grotesque situation, in which "weary" figures attempt to drink tea from an energetic tea set - an attempt to capture an almost impossible moment in life." 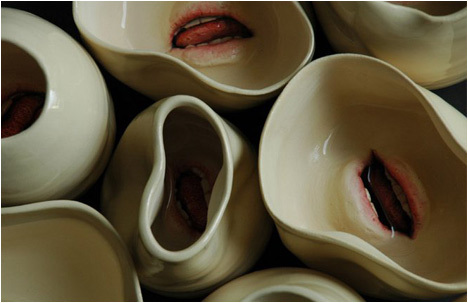 “By combining ceramic sculptures of body parts within, the still object is transformed from a passive, used object, to an active one with the ability to choose how to behave in an encountered situation: to feed or not, to shout, to stay or to escape. My works deal with emotional states and relationships”. "The use of fingers and mouths in my work is full of intent and meaning. The fingers and the mouth are very sensual organs in the human body and are therefore very powerful as separated items from it. 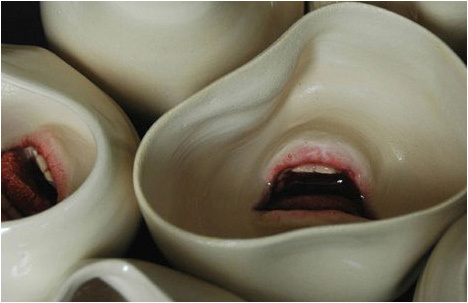 The “seamless” combination of these organs in plates or cups, appearing as one, creates, in my opinion, new items that “feel” their environment and respond to it."